Flume is a framework for populating Hadoop with data. Agents are populated throughout ones IT infrastructure – inside web servers, application servers and mobile devices, for example – to collect data and integrate it into Hadoop. MEMORY Channel is the fastest channel among the three however has the risk of data loss. The channel that you choose completely depends on the nature of the big data application and the value of each event. 85. Why we are using Flume? Most often Hadoop developer use this too to get data from social media sites. 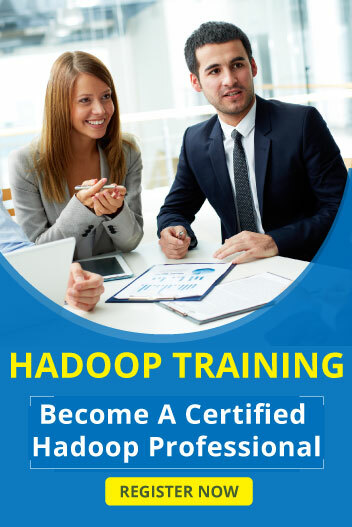 Its developed by Cloudera for aggregating and moving very large amount if data. The primary use is to gather log files from different sources and asynchronously persist in the hadoop cluster. Scalaz library has purely functional data structures that complement the standard Scala library. It has pre-defined set of foundational type classes like Monad, Functor, etc. Unit is a subtype of scala.anyval and is nothing but Scala equivalent of Java void that provides the Scala with an abstraction of the java platform. Empty tuple i.e. () in Scala is a term that represents unit value. Closure is a function in Scala where the return value of the function depends on the value of one or more variables that have been declared outside the function.